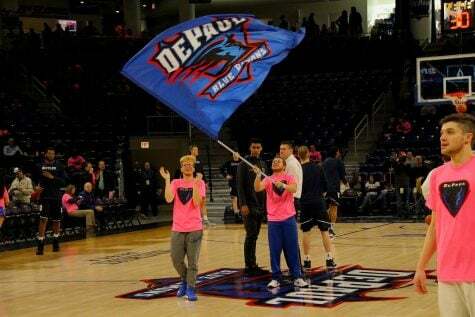 As DePaul’s men’s basketball team continues to dwell in the basement of the Big East standings, students and alumni are banding together to call for a change of leadership in the athletic department, taking aim at DePaul’s athletic director Jean Lenti Ponsetto. Last Tuesday, the same day prized recruit Tyger Campbell announced his decision to attend UCLA over DePaul, Purdue and Maryland, a GoFundMe account titled “Remove DePaul’s Athletic Director” was registered with the goal of raising $800 to purchase ad space in the DePaulia. In just over 2 hours, they surpassed their goal with donations ranging from $10 to $200. As of noon on Sunday Feb. 11, the fundraiser has collected over $1,700 in donations. 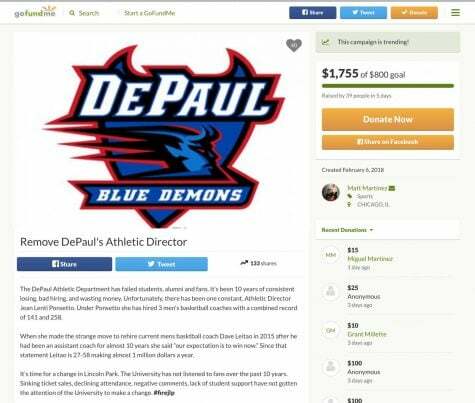 Matt Martinez, a 2012 graduate of the College of Communication in PR and Advertising who started the GoFundMe page, said the goal of the fundraiser is to capture the attention of DePaul’s administration and shine a light on what they believe is a series of mismanaged and “confusing” head coaching decisions. Carol Hughes, from DePaul’s Office of Public Relations and Communications, issued an official response on behalf of the university when asked for President A. Gabriel Esteban’s comment. After repeated requests by the DePaulia, Esteban — who replaced the athletic director at Seton Hall less than a month into his role as President — declined to comment himself. Hughes’ statement continued with a list of the athletic department’s accomplishments under Ponsetto, which highlighted student athletes’ successes in the classroom and in non-revenue generating sports. 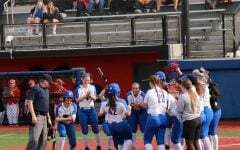 Hughes said 14 of 15 Blue Demon athletic programs have represented the university at NCAA championships under Ponsetto’s command, including 15 straight NCAA tournament appearances from DePaul’s women’s basketball team. 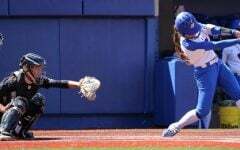 DePaul has also become a powerhouse in the Big East for racking up academic awards for their student athletes, she said. 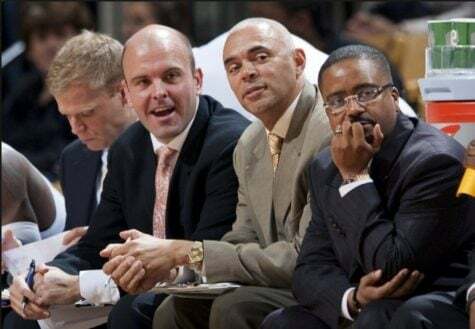 However, since Ponsetto took over as athletic director in 2002, DePaul’s men’s basketball team — the school’s biggest-budget and flagship program — has earned an NCAA tournament berth just once in 2003. 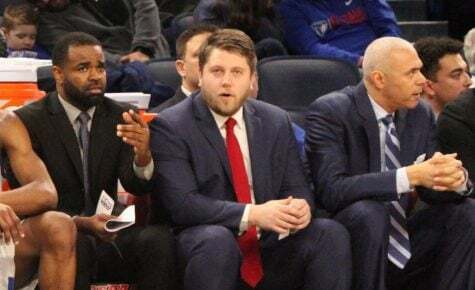 Ponsetto then guided efforts to move DePaul into the Big East, where stiff competition has made life difficult for the Blue Demons over the last decade. 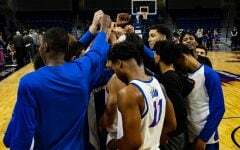 Now 16 years into the job and three coaching hires later, DePaul has three 20-win seasons and four postseason runs, including their 2003 NCAA tournament run. Ponsetto denied The DePaulia’s request for an interview but issued a statement in response to the GoFundMe campaign seeking to oust her as athletic director. While Ponsetto says she is proud of her student athletes, some alumni aren’t feeling so proud of their alma mater’s performance on the court — which, to some, is really all that matters. 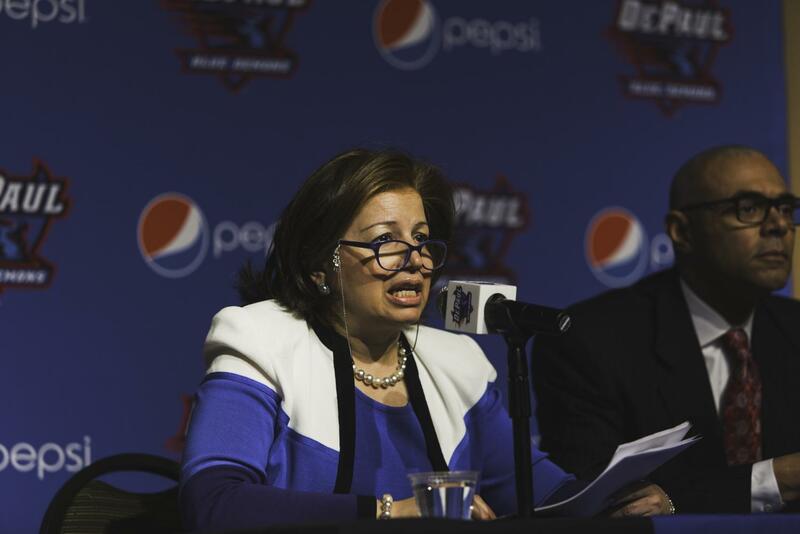 “If DePaul wanted to be a Loyola, a UIC (or) a Chicago State, play in a lower-tier conference, play most of their home games on campus and their sole goal was to graduate students and make great student athletes, then I get it,” Martinez said. “It doesn’t matter if you’re good or bad if that’s not the ultimate goal of the university, but from an outsider’s perspective, when you start making these big moves (namely transitioning into the Big East conference and building Wintrust) it sends the message that we care about basketball, we’re going to invest in it, and we want to have a great program. For DePaul fans like Martinez, Ponsetto isn’t a villain. 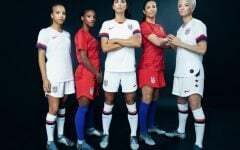 She just struck out on three bad coaching hires and now, they believe, it’s time for new leadership. 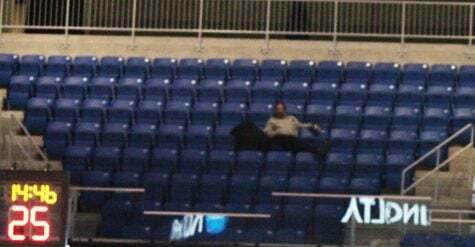 Traditionally DePaul students have shown some apathy for their athletics programs, though a poorly located arena in Rosemont and a new one that is still a half an hour away from campus certainly isn’t doing anyone any favors. 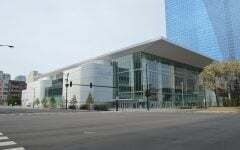 Since Wintrust opened in November attendance is averaging only 3,057; a feasibility study commissioned by the Metropolitan Pier and Exposition Authority projected 16 DePaul men’s basketball games would see an average of 9,500 fans. It has been well over two decades since Blue Demon basketball was a hot topic on campus. According to the description posted on the GoFundMe page, the calls for Ponsetto’s firing or resignation won’t stop anytime soon. Martinez says once the first ad is run in the DePaulia, a new fundraiser will begin with an eye on running an advertisement in during the Big East Tournament this March, though no official plan is currently in place. 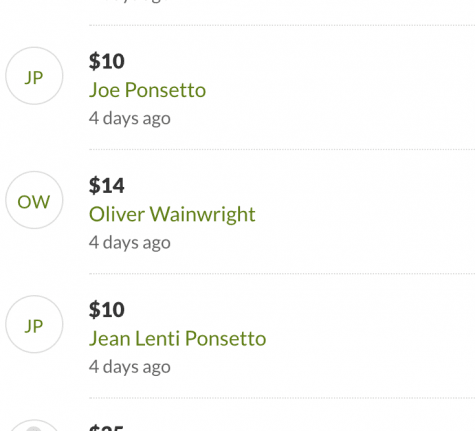 Prior to the launch of the GoFundMe campaign, the DePaul basketball Twitter-verse has been active with alumni calling for the end of the Ponsetto era. In the month of February, the hashtag “#FireJLP” has been tweeted 394 times from 57 accounts reaching 12,375 users, according to Twitter analytics provided by Keyhole. “I work for a prestigious financial services firm and used to receive and respond to 3-4 emails a week from students through volunteering with DePaul’s Alumni Sharing Knowledge (ASK) program,” The account’s operator told The DePaulia. 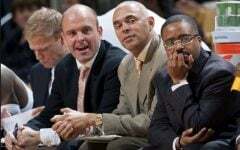 “Frustrated with the continued basketball losses, I removed myself from the program and told them that I’d volunteer again when Jean Lenti Ponsetto either resigns or is terminated. CORRECTION: An earlier version of this article said the GoFundMe to oust Ponsetto is targeting a television ad campaign this March for the Big East Tournament. While a second campaign is in the works for the Big East Tournament, the account’s administrator says it will not be televised, but published in a more cost effective medium. As a lifelong fan and alumni of the University, it saddens me the program has been managed so poorly. What Coach Ray and the Meyer family spent a lifetime to build, has been almost entirely destroyed by the last decade of decisions by both the AD and University Leadership. The previous President, and ESPECIALLY the Board of Trustees, completely dropped their oversight role with the University’s most visible asset. While accountability fro the last decade + of failure does fall on the AD, the former President and BOT should not be excused for their lack of oversight as well. Many fans and alumni hope that Dr. Esteban, who himself was the President at a Big East University with a successful basketball program, will finally hold the program to the historical standard that was built over 55 years of hard work by the Meyer family. I for one have vowed not to donate any money to the University until they start to manage this program with professionalism. 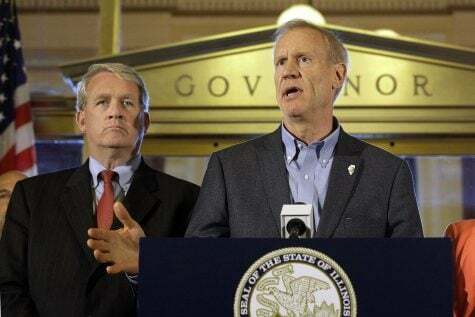 They have wasted millions on poor coaching hires, and have sunk over $80 million into a new stadium in support of this program that continues to fail under the Athletic Department leadership. Not only am I withholding any financial support to the University and program, I can’t even in good conscience even consider sending my own children to my alma mater if the University does not execute even a modicum of competent oversight on its most visible assest in which its poured tens of millions of dollars into it, with no accountability or expections. Complete and utter failure thus far. Men’s basketball actually recruited well under Jerry, but the on-court coaching and player development was horrific. 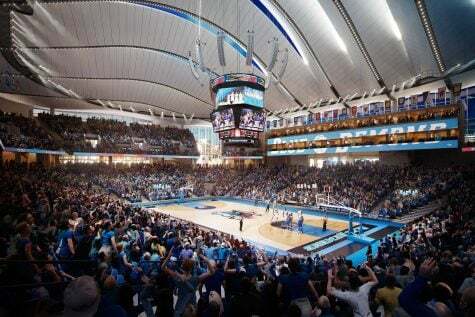 While I do take issue with rehiring coach Leitao, her responsibility for getting DePaul in the Big East and Wintrust Arena constructed have been big positives, not to mention the school is strong athletically in all other sports. I am originally from Chicago but live in California now, and it is great being able to see most of their games televised via FS1. That being said, I do think the athletic department can do a lot more to make going to games at Wintrust a more enjoyable experience, like having a DJ, a larger, more prominent band, providing more incentives for students to attend, developing a better partnership with local schools and having more ticket giveaway promotions for them. 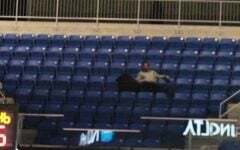 Until they develop a stronger fan base, DePaul should be giving away 2,000 – 3,000 seats per game to students and faculty from local middle and high schools. 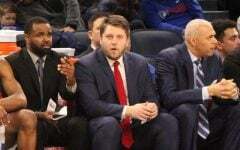 DePaul should’ve joined the Big East before JLP took the reigns as AD. The university BELONGS in the Big East, it’s the leadership in the athletic department that doesn’t. That doesn’t mean tbey aren’t fine people or a good fit elsewhere, but they are clearly/obviously/knowingly not fit to oversee and sustain excellence in our marquee sports program. One who boasts a world class city, phenominal men’s basketball tradition and membersip in a rich POWER FIVE conference. excited about them. So DEPAUL hires them? DePaul that consistently found itself nationally ranked #1 as the “little school under the el”.? That was regularly on the game of the week when that was the only game with national coverage and exposure.?! Whose coffers have grown and who benefitted from municipal financing for a brand new stadium?! This group (JLP) has had 9 lives. Please listen to the alum who’ve paid for their education,, attended games, tried to cheer from afar, have volunteered their time, effort and money. All significant universities do. I am amazed that the school still hesitates. I have waited all through the 80s, 90s, 2000s and now 2010s for One Shining Moment. Let it come in the form of a hostile boot to Ponsetto’s keester. A body at rest tends to stay at rest. 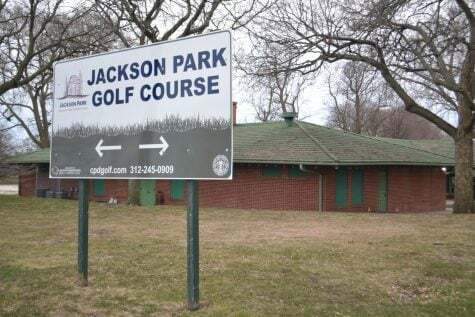 Harken back to 1978 when she served with Bob Gielow, Ray Lindblad, Tina Brown and Glenn Coble and one wonders what she is still doing here. The “small school under the ‘el’ tracks” is no more, yet the atavistic reality is that she remains. Back then, Robert Hamilton, M.D., may he rest in eternal peace, had just repaired by right supraspinatus tendon, Mark Aguirre was a freshman and Teddy Grubbs and Terry Cummings would arrive the following year. It’s time for new leadership top to bottom in the DePaul athletic department. 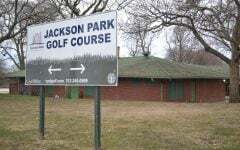 I hear Frank Lenti is available. Given the University’s loyalty to those who have overstayed their welcome perhaps the benevolent Vincentians could encourage his candidacy. Freshman Commerce majors looking for an empirical example of the Peter Principle need look no further than DePaul’s AD.